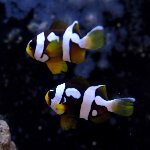 Alrighty folks, I have my own ideas but this is one of those times I'd like to push them aside and just ask all of you - for those of you who've spawned and reared white stripe maroon clownfish (Premnas biaculeatus) , what techniques have you found for minimizing / controlling aggression in the offspring? The Lightning Maroon babies have been fighting basically since the moment they settled. LOL....I told you they were mean muthas. I haven't tried this with white stripe maroons but I have put in several PVC fittings in the tank to provide hiding spots for black and white ocellaris clowns (probably the second meanest fish I've raised ). Crowd them so they cannot find the weakest link. I have also found adding pipes or fake anemones makes it worse. This is for offspring from gold strip parents. That said I expect a few deaths in grow out from aggression, less than 1%. Or give the ones you want to keep a lot of space with many tank decorations. I think a 29 with 20 or so fish would work. I can give it a try if you would like I have some that are in the .25-.5" range. Can you separate them to another tank? rgr, placing individual fish in individual tanks becomes the plan when the fish get older...of course this means having easily 50, but possibly hundreds, of small isolation tanks at your disposal. But when the fish are only a couple weeks old, or if you dont' have hundreds of isolation cases? I've had a couple batches moving along, and they basically fight like mad all the time, but I haven't had much in losses (if any) since they passed 30 day. I tend to think that distributed aggression isn't as bad, so I tend to agree with having lots, but that said, the dominant half dozen or so seem to demand that they have a space all to themselves so I'd think overcrowding could be a real issue. Perhaps just placing 10-20 or what ever number you think would work in different tanks, if available. It would give them all more room, and hopefully ease them up a bit. I've wanted a nice pare of maroons, but after hearing how mean they are, I still do!!!! streiten auf andere Zuchtbecken aufteilt so werden die Aggressionen verteilt . Ich setze sie dann immer zu kleinen schwarzen. Ich werden mal suchen ob ich noch bessere Bilder finde. I've used large plastic plants with gsm's Matt. It does create some territorial issues, but provides cover and breaks up the view across the tank. I use a very large plant that takes up about a third of the tank. Danke Sylvio - das sind einige wirklich interessante Setups und es scheint, wie Aggression ist etwas unter Kontrolle. Ich bin neugierig - die stark markiert / beraubt / gesichtet Maroon Clownfish - haben Sie schon viele so? Sind sie Goldstreifen Maroons, oder weiße Streifen? Es sind Goldstreifen ,ich züchte aber nicht viel davon da sie sich in Deutschland schlecht verkaufen lassen. Die Fehlzeichnungen lassen sich ganz leicht über die Wasser Qualität steuern.